Blog Out Loud Amazing Response! HAPPY *BLOG OUT LOUD* WEEKEND! 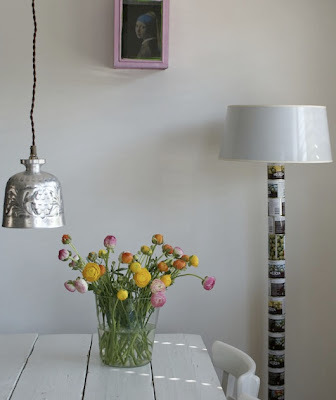 SMALL SPACES A Colorful Bungalow Inspires! LINK LOVE Let's Exchange Links! HAVE A DESIGN INSPIRED WEEKEND! SMALL SPACE STYLE Yes, You've Got it! These *fab* wool covered stools were covered on AT a few weeks ago by fellow writer, Beth. You have to check out Ingrid's work - seriously lovely! 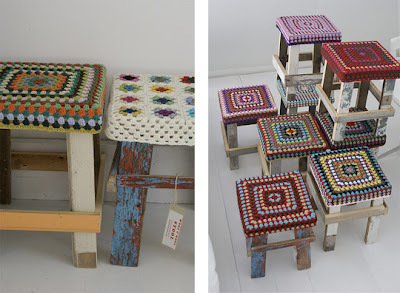 These stools would be a great addition to a small space, providing great color pops and texture. When choosing items for you small space, be thoughtful about the function and form. Since *we* small space dwellers can only have so much going on in our space, we need to consider the use. I've considered this stool and must. get. one. now. While not my style, I can appreciate how cute these might look in someone's home. I love that pendant light in the first pic! very cool for a bohemian home!